This entry was posted on January 11, 2017 by MarksShrimpTanks. To fully understand how to do a water change on a shrimp tank you must first understand a shrimp’s anatomy. 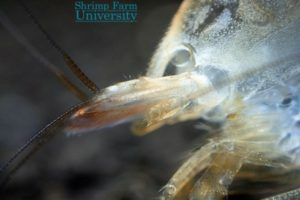 Shrimp have a layering formation in their exoskeleton much like humans do with their skin. 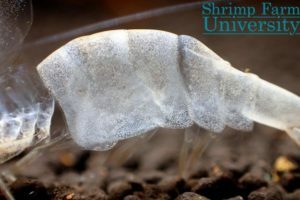 Now we will learn about the molting process of freshwater dwarf shrimp as this is a key aspect to understand when preforming a water change on a shrimp tank. 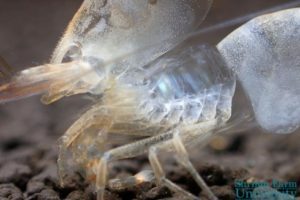 The first stage of molting is a Pre-Molt, this involves the shrimp expanding its body through water intake. You can see the same kind of process if you soak your own skin in water for a long period, it will become noticeable on the skin of your fingers and feet. At this point the shrimp is preparing the new shell inside of its old one, this is called the inter-molt stage. The best way to describe this is if you can imagine you were in a diving suit and you filled the inside with water. The secretion inside helps with nutrient disposition, noticeably calcium disposition into the old shell. This helps to harden the old shell slightly. This is the stage when the shrimp will exit its shell, (as I understand it) the shrimp will shrink and wriggle away from its old shell, separating itself from its old skin so to speak, before ejecting itself through a dorsal opening just behind the carapace. The next few hours are so vitally important to the shrimp because this is when it will decide how much water it will intake. Basically, it’s going to expand itself to its new size, and then its shell will hardens. This process its self can take upwards of two weeks. This is what brings us back to water changes. 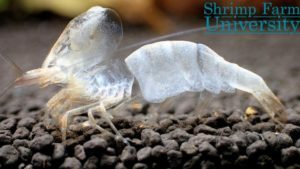 Shrimp cannot regulate osmotic pressure like fish do because the shell is rigid and this part is extremely important to understand. Any saline solution will always travel to the area of least concentration. For Example, if I do a water change with water that has a higher concentration of salt than the shrimp currently has, the shrimp cannot adjust to the changing levels fast enough to cope. 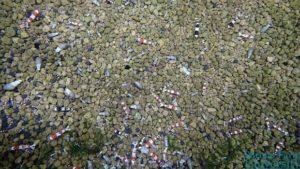 This can be measured with a TDS Pen (a helpful article to read would be Understanding Total Dissolved Solids (TDS)). What’s happening here is the salt more or less invades the shrimp cells through Osmosis (the spontaneous net movement of solvent molecules through a semi-permeable membrane into a region of higher solute concentration, in the direction that tends to equalize the solute concentrations on the two sides), to regulate the saline concentration the cells have no choice but to take water into the cell. If the saline concentration is very high the cell will take on more water to compensate. This results in Cell Hypertrophy (the enlargement of an organ or tissue from the increase in size of its cells) which leads to cell death and ultimately shrimp death. 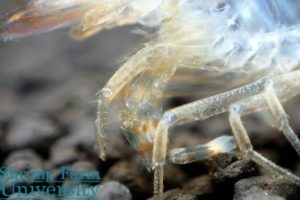 Signs of this happening can be when a shrimp goes motionless and lethargic after a water change, normally resulting in death a few days later if it cannot molt. Now, that you know all of these things, it should make it easier for you to understand when the proper time to do a water changes is. 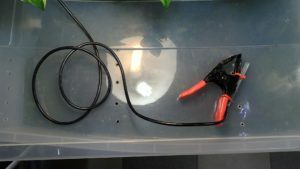 For a beginner that can’t measure things like TDS, pH, GH, KH, Temperature… etc. I advise only changing water every 2nd week, this is the safest way to allow your shrimp to molt properly every time at their own pace. 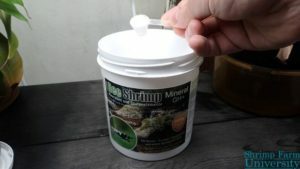 For the more advanced shrimp keeper that can make their own water to specific parameters that match what the shrimp is in, more regular water changes are achievable. 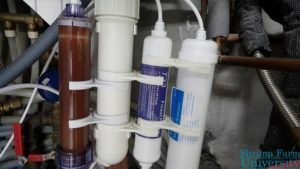 My own practice is to hit a certain TDS and not do a water change until I have to lower the TDS. My ideal tank numbers are a TDS of 140 (depending on the shrimp you keep you ideal number may be different), once I hit a TDS of 150 I flush out the tank with a 25% water change. 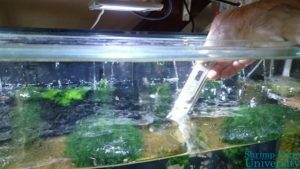 My TDS differences when doing a water change when comparing to the water being added in, vs tank water are 50ppm on larger tanks and only 10ppm on smaller tanks. The TDS Reading is there as a guide to point us in the right direction and not an absolute. 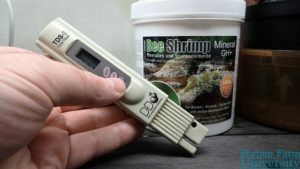 It is important that shrimp keepers understand that you just need to get your shrimp into a specific range and not to dwell on numbers to much. Shrimp Keeping is very easy and often times people try to make it to difficult! The water change routine I do is pretty simple. I fill up my container with RO water, add Salty Shrimp Shrimp Mineral until I get a TDS of 140 and then I let it sit for 24 hours to age. Aging the water gives the pH time to stabilize and come to room temperature. 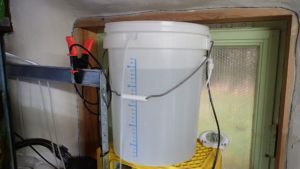 I then just add it to the tanks by means of a small pipe, this process takes me about 2 hours to change 25 liters (6.6 US Gallons) of water. 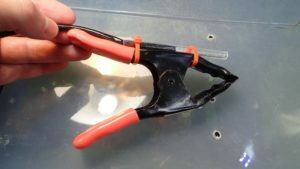 Hopefully you found this article on preforming water changes on a shrimp tank useful. Please feel free to post your comments/experiences below!